In large mixing bowl whisk together flour, baking powder, baking soda, salt, and white sugar. 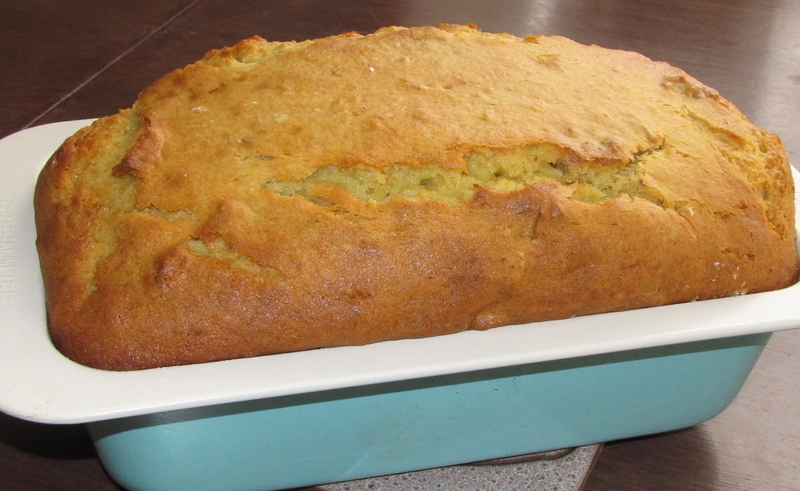 Using mixer on high, blend together, flour mixture, beaten eggs, butter, and mashed bananas. Cover and let set for about 15 minutes, while you prepare yeast mixture. In glass container, add room temperature buttermilk, warm water, brown sugar, and yeast. Whisk together and set yeast mixture by the stove to keep it warm, for about 5 – 10 minutes. It will rise and start to bubble. When ready to bake, preheat oven to 325*F. Add yeast mixture to batter and mix until completely blended don’t over mix. Pour batter into a greased and floured (with GF flour) 5×9 ½ inch loaf pan. If you have smaller pans make 2 loaves. Bake for 65 to 70 minutes or until bread is set in the middle and a toothpick inserted in center comes back clean. When done remove from oven and let cool before removing from pan. Enjoy!